THIS IS NOT A REPLACEMENT FOR FOLLOWING LABEL INSTRUCTIONS. ALWAYS READ AND FOLLOW THE LABEL FOR SAFE AND EFFECTIVE USE. Check the expiry date on Packaging. Formic Pro® has a 24-month expiration. Slow release technology begins to degrade when the product expires and could lead to excessive bee mortality. Optimal treatment temperatures for Formic Pro are between 50°-85°F/10°-29.5°C. Remove entrance reducers. 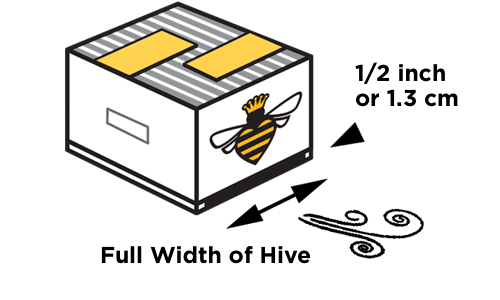 Bottom board entrances must be full width of the hive, minimum height ½ inch or 1.3cm and fully open for entire treatment. 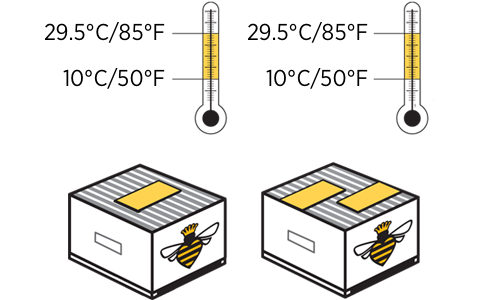 If colonies have permanently reduced entrances, set back the upper brood box by ½ inch or 1.3cm, or insert wedges between the bottom box and the bottom board to create a full entrance. *Close off screen bottom boards for maximum efficacy. Do not consider open screen bottom boards as ‘ventilation’; bees draw in air through the bottom entrance to ventilate the colony.